he privately owned U.S.-? ag foreign trading ? eet, which is an essential component of U.S.
Strawn LLP and the chair of its mari- of a substantial decline in available U.S. time practice group. War. For example, the U.S. Naval Insti- son wrote that we were saying goodbye marine credentialing requirements ef- as the world economy recovered and the tute Proceedings published an article in to the U.S.-? ag ? ying on vessels in for- fective January 1, 2017. U.S. Government sold much of its World 1882 by Lt. Cmdr. F.E. Chadwick, USN, eign trade there were 176 such vessels. You” in the Naval War College Review commercial employment to manning re- also re? ected in the National Security economic laws yet can freely sell ocean in 1993. These are but a small sample of serve vessels. There are a number of Directive on Sealift (No. 28 issued Oc- services to and from the United States. the pleas for help. historical examples when the pool size tober 5, 1989). Brown, Deputy Commander of the U.S. pool reserve was substantial. 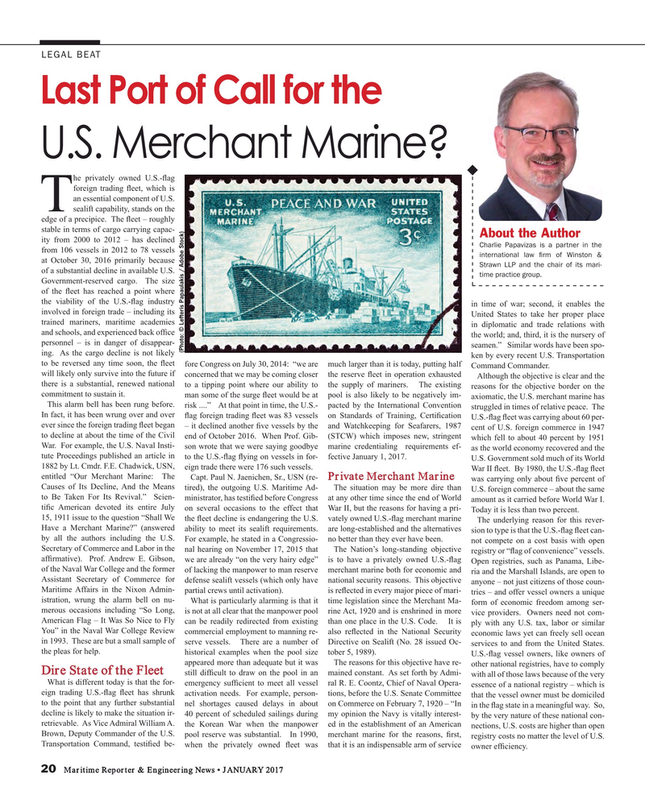 In 1990, merchant marine for the reasons, ? rst, registry costs no matter the level of U.S.
Transportation Command, testi? ed be- when the privately owned ? eet was that it is an indispensable arm of service owner ef? ciency.